The Intergovernmental Panel on Climate Change (IPCC) and the United Nations Framework Convention on Climate Change (UNFCCC) are the two UN intergovernmental bodies tasked with the responsibility of working towards international policies for action on climate change; the IPCC through providing state of the art assessments of what is known about climate change, its impacts and scenarios for action, and the UNFCCC by providing a forum for concerted global action. In recent years there has been a growing awareness that scientific knowledge alone is inadequate for solving the climate crisis. In the face of global climate change and its emerging challenges and unknowns, it is essential that decision-makers base policies and actions on the best available knowledge. Indigenous knowledge forms part of the knowledge base and is already seen as pivotal in fields such as sustainable development, agroforestry, traditional medicine, applied anthropology, biodiversity conservation and natural resource management. At the global level, the LINKS programme promotes recognition of indigenous knowledge in climate change and biodiversity science-policy. The Intergovernmental Panel on Climate Change (IPCC) is the international body for assessing the science related to climate change. IPCC reports provide the scientific basis by which governments may take decisions to address climate change. In 2009 the IPCC looked at indigenous knowledge in its Fifth Assessment Report on climate change impacts, vulnerability and adaptation. Released in 2014, the Fifth Assessment Report’s Summary for Policymakers supported the importance of indigenous knowledge as a foundation for adaptation and recognized that these have currently not been used in adaptation. Ford, J.D., Cameron, L., Rubis, J., Maillet, M., Nakashima, D., Willox, A.C. and Pearce, T., 2016. Including indigenous knowledge and experience in IPCC assessment reports. Nature Climate Change, 6(4), pp.349-353. The UN Framework Convention on Climate Change (UNFCCC) seeks to 'stabilise greenhouse gas concentrations in the atmosphere at a level that will prevent dangerous human interference with the climate system.' Discussions at the UNFCCC, such as the 2015 Paris Agreement, are the basis for international climate change norms. "... adaptation action should follow a country-driven, gender-responsive, participatory and fully transparent approach, taking into consideration vulnerable groups, communities and ecosystems, and should be based on and guided by the best available science and, as appropriate, traditional knowledge, knowledge of indigenous peoples and local knowledge systems ..."
"Recognizes the need to strengthen knowledge, technologies, practices and efforts of local communities and indigenous peoples related to addressing and responding to climate change, and establishes a platform for the exchange of experiences and sharing of best practices on mitigation and adaptation in a holistic and integrated manner;"
UNESCO conferences on indigenous knowledge and climate change provide a platform for deepening global understanding of indigenous knowledge relevant for climate change assessment and action. Foremost experts and knowledge holders from indigenous peoples, researchers and governments come together to share and exchange knowledge, including good practices, lessons and methodologies for how climate action and science can be reinforced by the inclusion of indigenous knowledge. Over the years, these conferences have been supported by Sweden, Japan, Denmark and France, and co-organized with indigenous peoples organizations, research bodies and fellow UN organizations. The conference aimed to bring together experts, researchers and scientists from indigenous peoples, local communities and governments. Speakers provided testimonies on how local communities are grappling with impacts of climate change and consequently their efforts to adapt. They also shared case studies highlighting how indigenous and local knowledge can be sources of renewed understanding, resilience, and resistance. The conference was organized by UNESCO and the National Centre for Scientific Research (CNRS-France), in partnership with Indigenous Peoples of Africa Coordinating Committee and Tebtebba. The purpose of the conference is to bring together not only indigenous peoples but also the experts, scientists and researchers who engage in the study and observation on the indigenous knowledge and local communities. Indigenous peoples, scientists and governments are invited to a transdisciplinary dialogue to better understand the role that indigenous and local knowledge can play, alongside science, in observing and responding to the impacts of a changing climate. To reinforce the links between cultural diversity and the sustainability of the global environment. The conference was co-organised by UNESCO and the National Museum of Natural History of France in partnership with Tebtebba, with support from the French Ministry of Foreign Affairs , Sorbonne University, Swedish International Development Cooperation Agency, the United Nations Development Programme (UNDP), Japanese funds-in-trust to UNESCO, National Research Agency of France, and Conservation International. 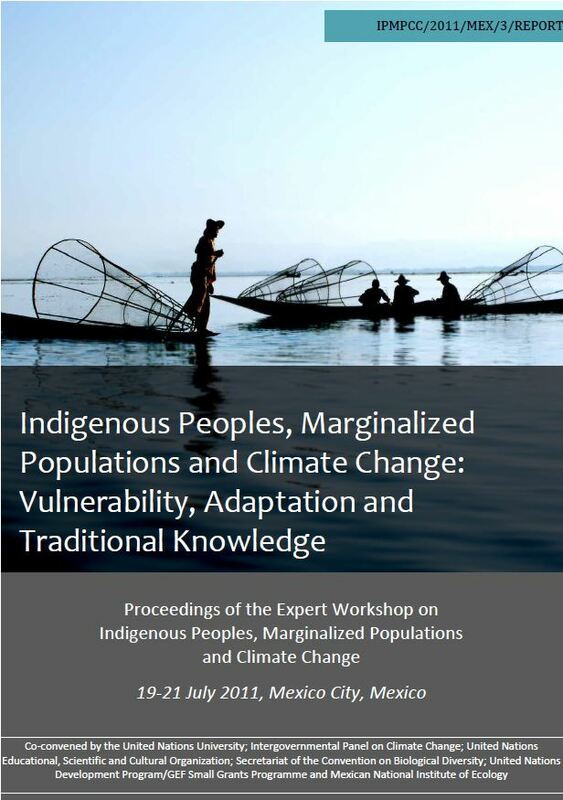 "Indigenous Peoples, Marginalized Populations and Climate Change: Vulnerability, Adaptation and Traditional Knowledge," the workshop aimed to identify, compile and analyse relevant indigenous and local observations, knowledge and practices related to understanding climate change impacts, adaptation and mitigation. Representatives of indigenous peoples and marginalized populations, natural and social scientists, and other experts in relevant domains came togeter to ensure that experience, sources of information and knowledge (scientific, indigenous and local), along with data and literature (scientific and grey), focusing on vulnerable and marginalized regions of the world was made available to the authors of the IPCC 5th Assessment Report and the global community. The workshop was co-organized by UNESCO-LINKS with the Intergovernmental Panel on Climate Change (IPCC), United Nations University (UNU), Secretariat of the Convention on Biological Diversity (SCBD), United Nations Development Programme (UNDP). CBD Impacts of Climate-related Geoengineering on Biodiversity: Views and Experiences of Indigenous and Local Communities and Stakeholders (UNEP/CBD/SBSTTA/16/INF/30) .